At present, there isn't anything on the UC web site about kiln rings. Obviously, this is a subject of particular interest to cement producers - and it is to me too. 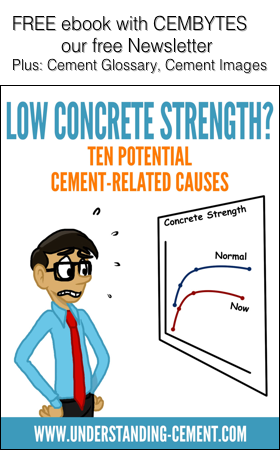 My first thought was to put up a page on the web site and discuss the condensation of volatiles etc., but then I thought that anyone involved in producing cement knows all about that anyway and that maybe we could do something more interesting. My idea is to have a series of pages on kiln rings/blockages based on information and images from anyone with an interest in the subject-most probably mainly cement producers. As more examples are submitted, an increasingly useful body of information will accumulate that anyone can refer to freely. Maybe we could add a discussion forum? My suggestion is therefore to invite anyone involved in cement production who has a problem with rings or blockages in the recent past or over the next few months to send to Understanding Cement a paragraph of two about what happened, how it was dealt with and perhaps with some photos showing where the blockage occurred and maybe a photo inside the kiln if possible. Any accompanying analyses (microscopy, XRF, XRD etc.) would be splendid. This could be on an attributable basis, or anonymously, whichever is preferred. (Some people do not like to air their problems in public!) Obviously, I will have to know details of the location and of who is submitting the information but these need not be put on the web site. I will collate the information into some sort of standard format and put it on a special page on the web site. I don't have a cement kiln but I do have optical and scanning electron microscopes. (My day job is as a consultant in the microscopy of cementitious materials). Of course, you don't have to send any actual kiln material - just send the description, photos and analyses. (Also, a description of the kiln, raw materials used etc.). As I don't want to get into any trouble(!) any participation in this project is only on the clear understanding that all material (descriptions, pictures, analyses, samples etc.) 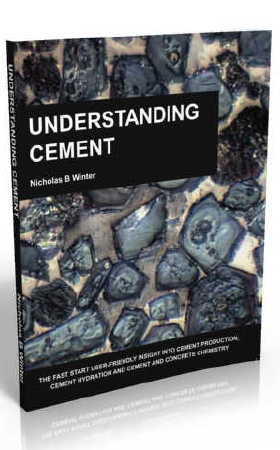 submitted to Understanding Cement is done so on the basis that it will be put into the public domain. There should be no issues of confidentiality. The only exception is that, on request, the source will not be identified in the published material. (The default assumption will be that the source will be identified). If you would like to take part, or just make contact to say you might be interested, or have any other comments on this proposal, please get in touch using the contact form . Copyright © 2005-2014 WHD Microanalysis Consultants Ltd. All rights reserved.